WASHINGTON D.C. - Many fraternities have earned nasty reputations back home. But for some alumni of the Alpha Phi Omega (APO) who’ve since settled here, new beginnings also mean rediscovering the spirit of brotherhood, camaraderie and selfless service. The APO District of Columbia Alumni Association (APODCAA) is shipping 29 dialysis machines to two major hospitals in Mindanao – the Bukidnon and Cagayan de Oro Provincial Hospitals. The machines, worth about $14,000 apiece, were donated by the Holy Cross Hospital in Silver Spring – Maryland’s second biggest medical facility – that has a large Filipino medical staff. "The Holy Cross management was elated when we told them we were sending the machines to the Philippines," said Jun Cristobal, adding "aside from being expensive and still very usable, they were happy to know that the donation was being made in honor of Nenita Ramos." Ramos was a Filipina dialysis technician in the hospital’s nephrology department who died last December. The APODCAA members donated time and treasure to ship the machines back home. Santi Sipin, who’s supervising the group’s dialysis machine project, said the final tab could reach over $6,000 – most of it coming out of the pockets of members. That’s a princely sum for most of them because nearly all are wage-earners with their own families to support. The amount could be bigger if they put a dollar value to the nearly 400 man-hours they’ve devoted to the project, much of it during weekends which are usually spent for recreation. But Cristobal explained they’ve tried to turn the weekend activities into potluck family affairs. Part of the freight cost is being shouldered by the provincial governments of Misamis Oriental and Bukidnon, as well as Bukidnon Fil-Am associations here. "We embarked on this project last Feb. 15," APODCAA president Ferdinand Gomez told ABS-CBN’s Balitang America. 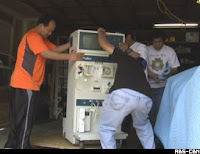 It wasn’t really part of their 2008 program but when they learned Holy Cross Hospital was upgrading its dialysis machines, the group convinced hospital executives to donate the old machines to Philippine hospitals. "Dialysis treatment is really very expensive back home so we thought that in our own small way, we can help make treatment more affordable," Cristobal averred. In 2006, the average cost of a single dialysis session in the Philippines exceeded P3,000, according to Global Dialysis. A seriously ill patient may require from two to four treatments a week. Great post. Impressive. I'm also part of a fraternity. In fact, I'm one of the founding brothers for one of the first natiowide Filipino-American fraterity. It's called Chi Rho Omicron aka XPO. It's a Filipino-American Historical Fraternity based in California. Keep up the great work. Keep in touch as well.